Add another one to the top 15 list: Notre Dame Stadium saw 7.19 terabytes of data used on its Wi-Fi network during the Sept. 29 home game against Stanford, a 38-17 win for the Fighting Irish. The top mark so far for the year-old network had 27,812 unique connections during game day, according to statistics provided by Notre Dame. The peak concurrent connection number was 22,447, and the network saw peak throughput of 7.867 Gbps, which occurred during the pregame flyover. 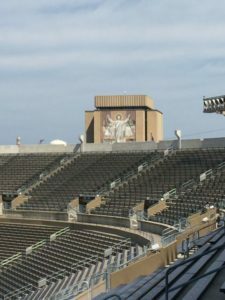 According to Notre Dame officials, the fans on the network “maxed our 10Gbps border firewall during the game a few times,” over a firewall connection shared with other networks on campus. All statistics were recorded between 5:30 p.m. and 1:00 a.m. local time, according to Notre Dame.